Mp3tag, a popular app that allows users to edit metadata of audio files is now available for download in the Microsoft Store. The developer has ported the Win32 app to the Microsoft Store and you can download it on your Windows 10 PC. If you’re unfamiliar with Mp3tag, it’s an app that lets you fix the broken audio files. For example, when you a rip a CD onto your PC, sometimes the process could leave you messy-looking file. Mp3tag program will help you identify tags and retag album covers in an easier and faster way. In a tweet, the developer revealed that the Microsoft Edition works just like the Win32 application. notes after an update. Feature-wise it’s exactly the same. 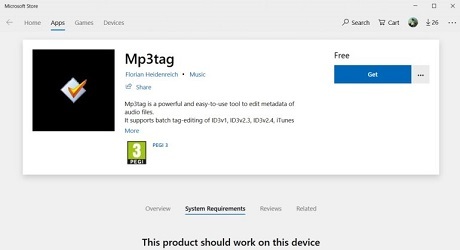 “It [Mp3tag] supports batch tag-editing of ID3v1, ID3v2.3, ID3v2.4, iTunes MP4, WMA, Vorbis Comments and APE Tags for multiple files at once,” Microsoft Store description reads. The app can access the online database so that you can automatically gather proper tags and download cover art for your music library. Similarly, there are some other advanced functions that lets you rename files based on the tag information, create playlists and import or export tag information. If you’re interested, you can download the app from the Microsoft Store.